All the art tools you need! Designed for repeated classroom use. Box of 200 non-toxic, conical tip markers. All in a sturdy resusable lift lid box. Washable, 8 Colors. 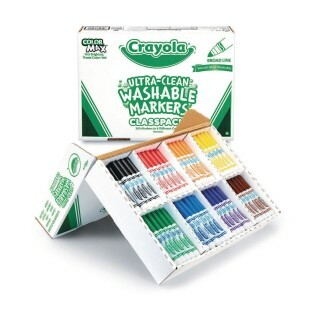 These quality Crayola® washable markers are perfect for drawing and coloring projects in the classroom or at home. Crayola's® 'worry-free' ink washes from skin and most clothing. Markers contain more ink than other brands. Sturdy, reusable lift-lid box contains 200 washable markers, 25 each of 8 classic colors: red, orange, yellow, green, blue, violet, brown and black. Non-toxic. Save with Classpack™ vs. 8-count boxed washable markers. Multipurpose, conical tips. Child-safe caps. Classpack now includes 12 extra caps. love that the markers are washable both on kiddos and tables. These are the best markers! They Residents really enjoy the colors in this box . I buy this product many times each year! It is worth paying extra money for Crayola brand markers instead of the generic brands. Typically I have found that the generic brands don't make it longer than a season.